Efforts to engineer genomes in wild populations have huge potential for good—but the real world is more complicated than the lab. Until now, humans have never been able to seriously consider how to cheat evolution. But now that the CRISPR/Cas9 system has made genome editing easy and efficient, it might be possible to manipulate the genomes of entire wild populations—and even to force the spread of genes lethal to their carriers. Although the risks and ethical concerns of this proposal have sparked debate, being able to control wild populations could have massive benefits, including eradicating devastating human diseases. But while researchers are able to create all types of drives in the lab, the limits on gene drive’s power in the wild haven’t received as much scientific and media attention. Fundamental questions remain unanswered. How will gene drives spread? How—and when—could resistance arise? Spurred by its potential to do good and to do harm, geneticists are racing to understand how gene drive might work—and how it might fail—in the wild. In principle, using CRISPR/Cas9 to drive a gene into a population is beautifully simple. Select a target site in the genome to be modified. Deliver to the host’s cells a template consisting of the DNA sequence to be inserted flanked by sequences homologous to the target site, along with a gene encoding the DNA-slicing enzyme Cas9 and a sequence coding for an RNA that guides Cas9 to the right DNA to cut. The Cas9 produced from this construct will chop the host’s genome at exactly the target site specified by the template. When the cell tries to repair the cut, it often relies on DNA with a matching sequence from the homologous chromosome. But during this process, called homology-directed repair, the cell sometimes mistakes the gene drive template for the homologous chromosome. When the cut is repaired this way, the cell is tricked into including the entire gene drive sequence, cementing a permanent copy into the genome. Now the patched-up chromosome becomes a template itself: Cas9 can snip the normal copy of the chromosome and insert the drive there, too. Heterozygotes for the drive can then pass on the foreign sequence to their offspring as if they were homozygotes. Hypothetically, this would make it possible to engineer an entire wild population using a precise genome edit. In this depiction of gene drive, a circular DNA molecule called a plasmid is inserted into cells. The plasmid contains a gene for the DNA-cutting enzyme Cas9, a sequence encoding a guide RNA (gRNA) that defines the sequence Cas9 will cut and a gene to be inserted at the cut site (payload gene). 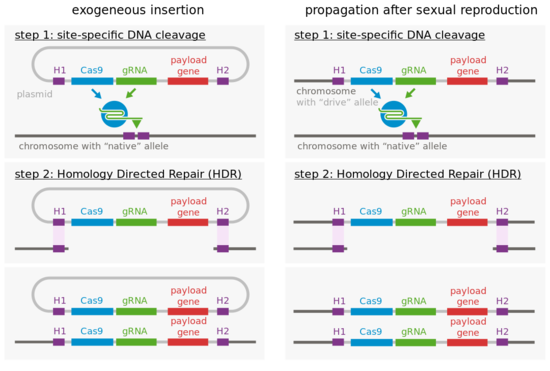 These sequences are flanked by homology arms (H1 and H2) that match up with DNA surrounding the cut sequence in the normal chromosome, allowing the whole DNA cassette on the plasmid (H1, Cas9, gRNA, payload gene, H2) to serve as a template for repairing the cut chromosome. Then, the repaired chromosome acts as a template itself when Cas9 cuts the homologous chromosome, so both copies of the chromosome in the cell contain the DNA cassette. Thus, the progeny will inherit the inserted sequence (almost) 100% of the time. Image by Thomas Julou (Own work) [CC BY-SA 4.0 (http://creativecommons.org/licenses/by-sa/4.0)], via Wikimedia Commons. Even in controlled lab environments, gene drive has inherent limitations. The trait to be modified must be genetically determined—preferably by a single gene. Gene drive isn’t practical in organisms with long generation times, such as humans. And for the drive to spread, drive carriers must be able to infiltrate the natural population, ensuring that the drive is passed on to the normal organisms’ progeny. This means gene drive can’t affect organisms that don’t reproduce sexually. These constraints aren’t a problem for all applications. 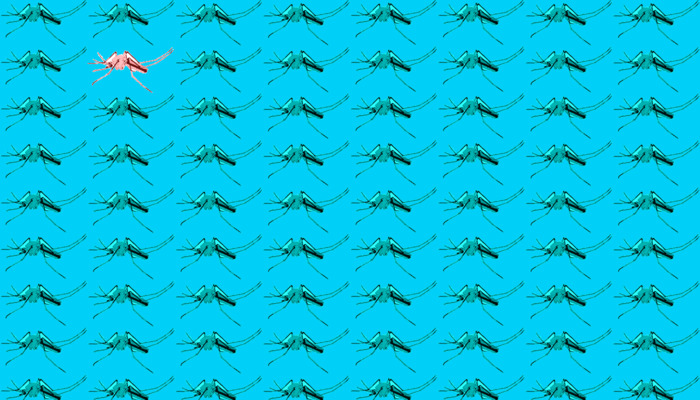 There’s considerable excitement about eradicating mosquito-borne illnesses like malaria—a disease that kills hundreds of thousands of people every year and sickens hundreds of millions more—by using lethal gene drives to control mosquito species that transmit the disease, or even push them to extinction. Although the goal is ambitious, tantalizing evidence suggests it might be possible. In 2015, researchers at the University of California in San Diego reported a proof-of-concept experiment on a caged population of flies, which showed that heterozygotes for a drive could pass it on to 95-100% of their progeny, as opposed to the Mendelian 50%. But while it’s promising that an allele can be driven to high frequency using this method, there are reasons to suspect that the situation in the wild may be very different. “For this drive to work, it needs to recognize the site in the genome where it’s going to insert itself,” says Philipp Messer, a researcher at Cornell University studying the evolution of resistance to gene drives. “In those lab populations, they were all the same strain, so they always had exactly the same sequence at that target site. And that’s why it worked in all of those flies.” In wild genomes, there’s much more natural variation, so susceptibility and resistance will be less consistent. According to Messer’s recent work, this standing variation might not even be the biggest source of resistance alleles. Resistance can also arise through other mechanisms, such as mutations caused by the drive mechanism itself. When DNA is cut, the cell doesn’t always fix the break using homology-directed repair. Instead, it can simply stitch the ends of the DNA together—a technique called non-homologous end joining. This often results in mutations, which could leave the target site unrecognizable to the driver system. Messer’s group is conducting experiments to better understand how these resistance alleles arise. They release flies with a driver construct into a caged population of normal lab flies, and then closely monitor the flies to see when the drive comes close to fixation—that is, when nearly every individual to carry the gene drive at both loci. Once this happens, they check the population for the resistance alleles they predict will evolve. It’s possible that these resistance mechanisms won’t take effect rapidly enough to prevent the drive from spreading through a population. By the time resistance crops up, we may already have achieved our goal. But even if resistance is slow to develop, gene drives face other hurdles in natural populations. Another evasion method is inbreeding, a topic studied by Professor James Bull at the University of Texas at Austin. In normal circumstances, inbreeding can harm a species by reducing genetic diversity, making it more likely to succumb to threats. But when harmful gene drives spread through a population, inbreeders may have an advantage. This edge arises because inbreeding increases the frequency of homozygotes in the population. “If the population doesn’t have any heterozygotes at all, then individuals either don’t carry the gene drive or they’re homozygous for it—in which case, they’re dead,” Bull says about lethal gene drive. According to Bull, whether a species will evade gene drive via inbreeding depends on the magnitude of the genetic costs of inbreeding. “The offspring that are inbred aren’t quite as fit as the wild type,” Bull says, and in some species, the fitness of inbred offspring may be well below that of the wild type. But if this reduction in fitness is less detrimental than the drive, it’s very likely that inbreeding will sidestep the drive. To circumvent these resistance mechanisms, some have proposed introducing multiple drives at once, but even this may not be enough to defeat nature. Cellular molecules that interfere with the Cas9 endonuclease protein itself or its expression could be enough to suppress multiple drives at once. “We’re all guessing right now. To me, that makes it somewhat exciting,” Bull says. According to Michael Wade, a Distinguished Professor of Biology at Indiana University Bloomington, drive mechanisms might involve only a certain type of gene, but the genes that oppose them could be anywhere in the genome. But despite many means for populations to evolve resistance to gene drives, several successful drives exist in nature. The Drosophila genome, for instance, harbors several copies of DNA sequences called P-elements, selfish genes that splice duplicates of themselves into random sites in the genome. Fifty years ago, P-elements didn’t even exist; now, you can’t find a fruit fly without them. But one key difference is that P-elements can insert themselves anywhere in the genome; they don’t require a precise target site like the CRISPR/Cas9 system does. And aside from sometimes inserting in an important gene, P-elements aren’t harmful to the flies, unlike the many proposed gene drives intended to disable or even exterminate their host species. Genes drives much less benign than P-elements have also spread in the wild. In natural fruit fly populations, a complex of driven genes called Segregation Distorter interferes with sperm production in males that possess one copy of the drive, causing dysfunction of spermatids that lack the drive. As a result, Segregation Distorter has spread through the natural population even though it diminishes carriers’ reproductive fitness. Another strikingly selfish gene, called the t-allele, has also been found in some mouse populations. Males homozygous for the t-allele are sterile, but heterozygotes disproportionately produce sperm bearing the t-allele. The allele can thus be driven to high frequency despite causing serious fitness impairments in male carriers. Promisingly for gene drive hopefuls, this implies that it might also be possible to use CRISPR/Cas9 to force a deleterious selfish gene of our own design to high frequency. No one knows what genetic variants are responsible for hampering Medea’s spread, but something in nature must be stopping it from becoming fixed—at least at the predicted rate. The interplay between drives and resistance appears more complex than we understand. Medea isn’t an exceptional case. According to Wade, most drives in nature have suppressors. If a drive weakens the organism that carries it, there will be selection for resistance against the drive. That’s why some have argued that rather than using drives to reduce or eliminate the population that carries it, gene drive might better be used to tamper with a vector so that it can no longer support a pathogen—for instance, by altering a gene in mosquitoes that the malaria parasite requires to grow or spread. Instead of altering a vector gene needed by the parasite, some have suggested inserting whole new parasite-fighting genes into vectors’ genomes—and proof-of-concept experiments in lab populations have shown promising results. But in larger wild populations, the parasite’s response is unpredictable, and a mutation or two might allow it to grow again. Even if the parasite can’t evolve resistance, selection may still favor flies without the drive, preventing it from establishing itself in the population. Driver alleles cut chromosomes, and off-target effects could disrupt important parts of the genome. Although this hasn’t seemed to stop P-elements in flies from spreading, it may still be a hindrance for other drives, and different organisms may not have as much tolerance for slicing up chromosomes. Beyond these molecular obstacles, gene drive may face difficulties at an even larger scale. For many applications, the drive must be able to spread from one local population to another—and predicting how likely that will be and how rapidly it might occur requires understanding how far individuals migrate, how fast they move, and other factors. And even if individuals of the targeted population readily intermingle with those of neighboring populations, the drive may face new challenges due to genetic variance in the neighbors. The barriers don’t end here: there are almost certainly other problems we haven’t even foreseen, and many are likely species-specific. But maybe that’s not such a bad thing. “Let’s say you don’t want to eradicate the population, but you just want to severely weaken it,” says Messer. “You could drive a really deleterious allele to a population, it would spread there, the population would decline, and eventually only the few individuals with resistance alleles would survive.” The suppressed population could then be subjected to other challenges, such as pesticides. In the case of malaria-carrying mosquitos, their numbers might be reduced enough to halt the spread of malaria before the population rebounds. Although many call for caution and further study, the potential for massive benefits has others clamoring to release CRISPR/Cas9 gene drives into the wild. Whether or not we’re ready, our predictions about gene drive’s effectiveness may soon undergo field tests. Although resistance would be a disappointment to many, the fact that it seems so likely to develop could actually serve as a natural safeguard against the out-of-control drives that has prompted concern about the technology. “I think if we know one thing for certain, it will be difficult in practice to actually cheat evolution,” Messer says. After all, evolution has spent a lot longer practicing this game than we have.